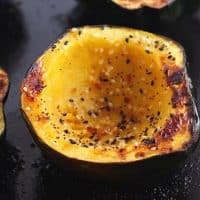 Simple toaster oven acorn squash bowls make a fantastic fall side dish or dinner for one or two. 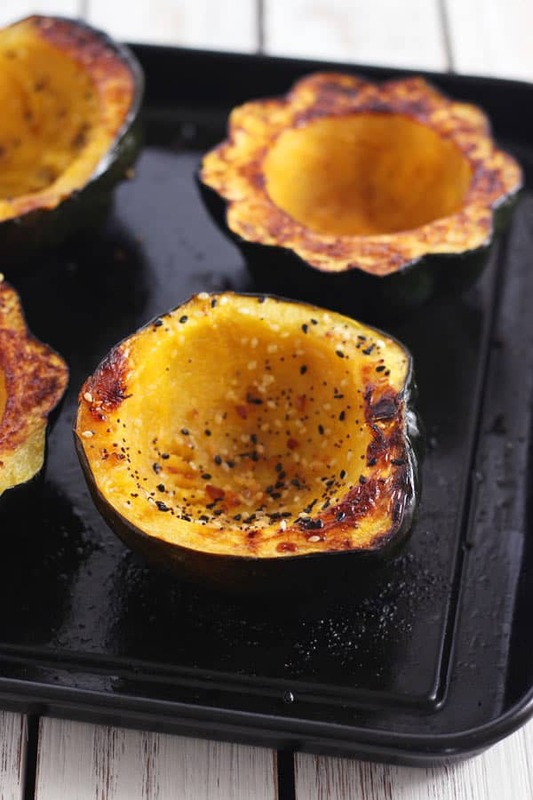 Nutty, sweet and earthy acorn squash halves are coated with oil and cooked in your toaster oven until tender and nicely browned. Easily turn them into edible casserole dishes by stuffing with vegetarian chili, baked macaroni and cheese or yogurt with cinnamon for a healthy and satisfying veggie-filled breakfast. The first squash I tried to cook on my own was a big ol’ butternut squash. Talk about a bad one to cut your teeth on. If you’ve ever chased one around your cutting board repeatedly getting your knife stuck in it then you know cutting butternut squash is scarier than any movie where dolls come to life. Hands down the perfect squash for cooking in your little toaster oven is a delicata squash, but acorn squash is a close second for sure. Acorn squash has a rind/skin that’s much thinner than butternut squash so it’s easier to slice and cook and because of its small size, we can fit it in both of our toaster ovens. 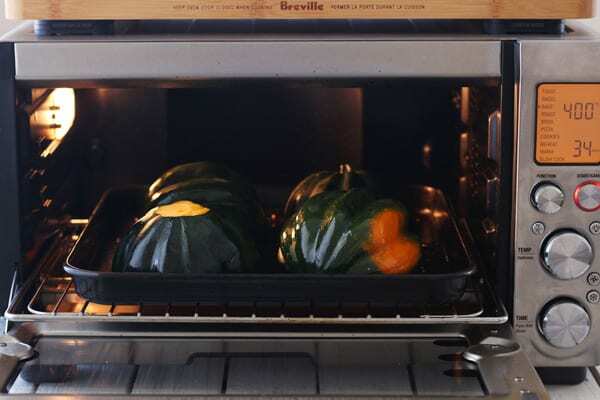 Usually, I can fit at least one acorn squash in our little Oster and two in our bigger Breville Smart Oven Pro. 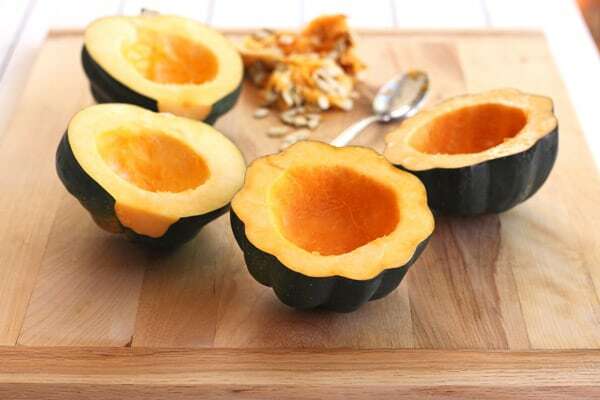 Place your squash on a cutting board and slice in half lengthwise (for longer ‘acorn” shaped bowls) or widthwise (for round “flower” shaped bowls). If the squash is rolling around slice a small portion off of the bottom of the squash to provide a flat base to rest it on before slicing. Scoop out the seeds using a spoon or ice cream scoop. Would a video be more helpful? Here’s a fun one for How to Cut an Acorn Squash that’s less than 1 minute long. With the slicing and scooping out of the way, we get to season and roast! You could go simple and savory with olive oil + salt + pepper, perfect for a scrambled eggs and peppers stuffing. Or use your favorite spice blend like seasoned salt or the Everything but the Bagel seasoning from Trader Joe’s. Coconut oil and cinnamon are nice if you’re planning to fill your acorn squash with fruit and yogurt. To make them sweeter, flip the squash over 20 minutes into the cook time and sprinkle with brown sugar or drizzle with maple syrup. Adjust your toaster oven’s cooking rack to the bottom placement and preheat it to 400F on the “Bake” setting. Line your baking pan with a toaster oven silicone baking mat for easy cleanup or lightly oil the pan. 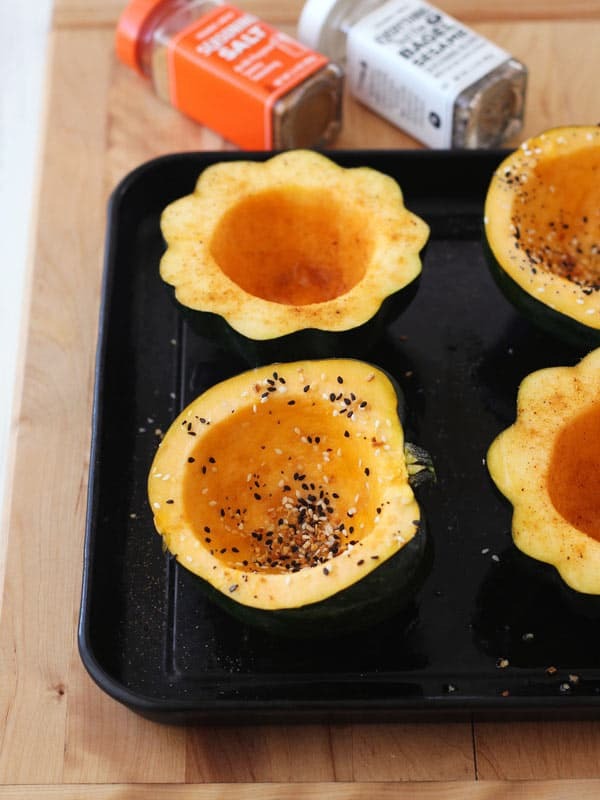 Place your oiled and seasoned squash halves with the insides facing down towards the baking pan. Cook squash for 30 to 45 minutes (depending on the size of your squash) until a fork slides easily into the back of the squash and the edges are browned. Allow squash bowls to cool for a few minutes before filling. 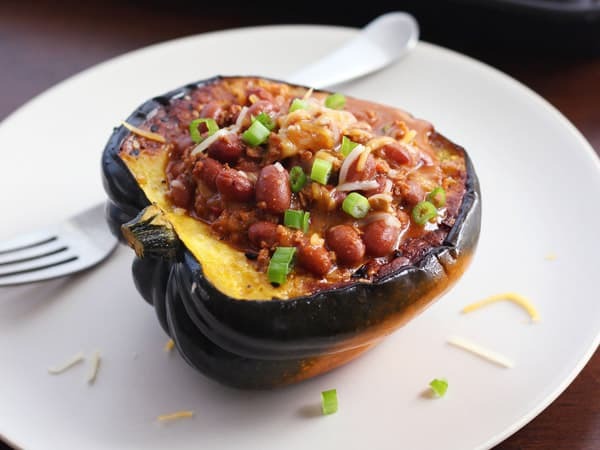 Homemade or canned vegetarian chili pairs perfectly with the sweet acorn squash. Top with shredded cheese, green onions and a dollop of plain greek yogurt for a healthy fall lunch or dinner. 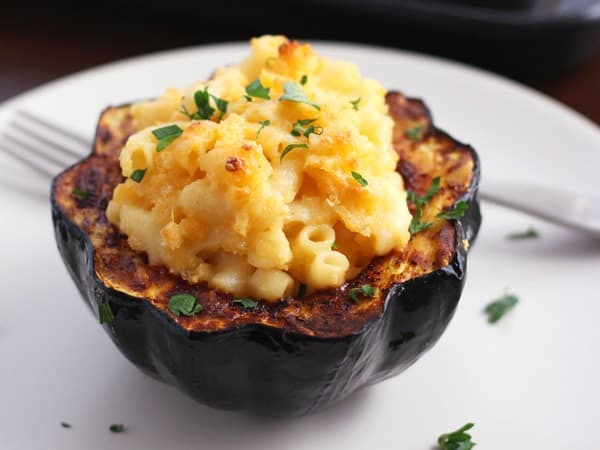 Stuff your roasted squash with leftover mac and cheese for an indulgent meal. After filling the squash place in a 350F toaster oven for 15 to 20 minutes until the macaroni and cheese is warmed through. Roast squash with coconut oil and cinnamon, cool slightly and fill each bowl with 1/3 cup of yogurt. Sprinkle with chia and pomegranate seeds, cinnamon and some small batch almond granola for a tasty high fiber, high protein, and vitamin-rich fall breakfast. 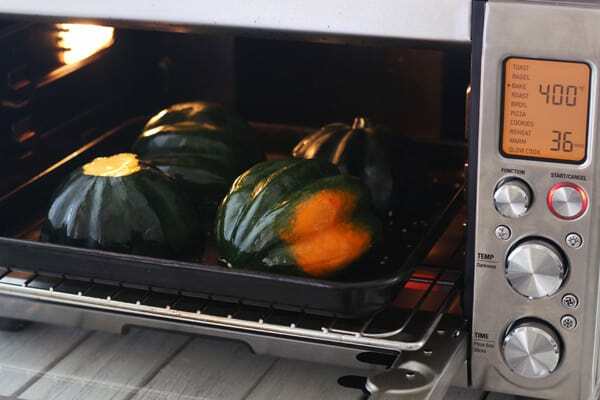 Looking for more savory toaster oven squash recipes? 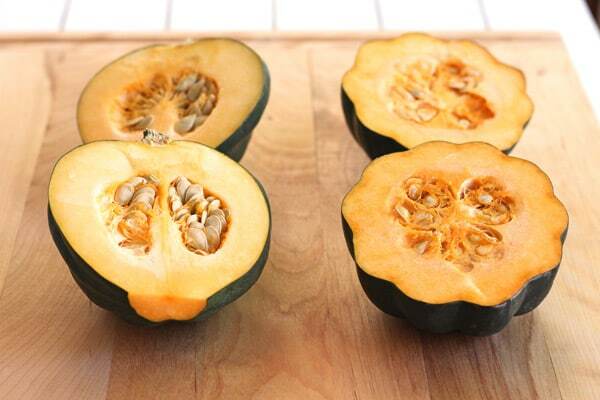 Sweet and earthy acorn squash make a fantastic fall side dish or dinner for two. Adjust toaster oven cooking rack to the lowest position and preheat to 400F on the bake setting. Lightly oil a baking pan or line with a small silicone baking mat for easy cleanup. Using a very sharp knife carefully slice the squash in half. Scoop out seeds and discard or save for roasting later. 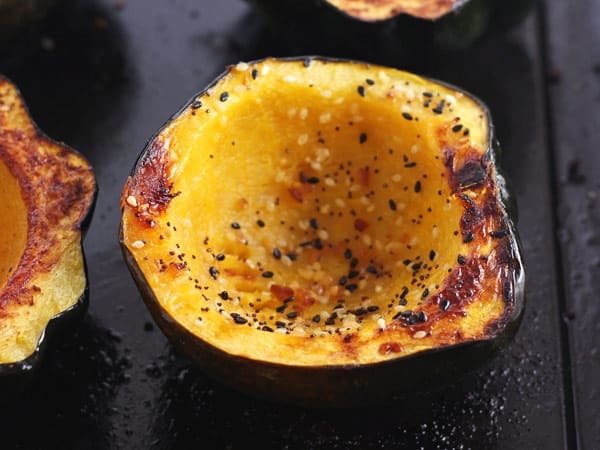 Drizzle the inside of each squash with 1/4 teaspoon oil, use your fingers to rub the oil over all of the exposed orange flesh. Season the squash generously. Place squash flesh side down on your prepared pan and roast at 400F for 30 to 45 minutes. 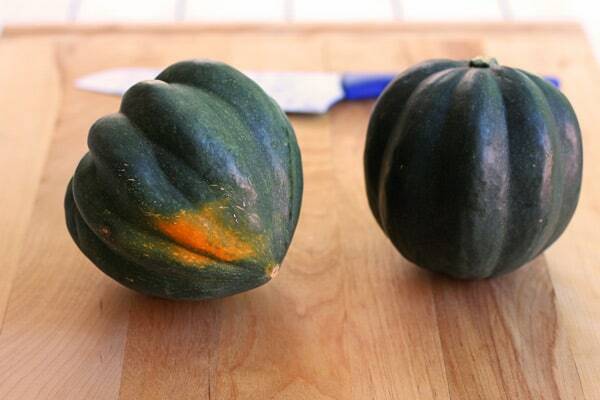 Squash will be ready when a fork or knife slides easily through the skin and flesh. Allow squash to cool slightly before filling and serving. Convection Toaster Ovens: Keep the temperature at 400F but begin checking squash after 20 to 25 minutes, adding more time as needed. Rewarm leftover squash bowls in a 350F toaster oven for 20 to 30 minutes. This recipe makes 4 acorn squash bowls, nutritional information is an estimate for 1 unfilled acorn squash bowl. What a beautiful looking dish! 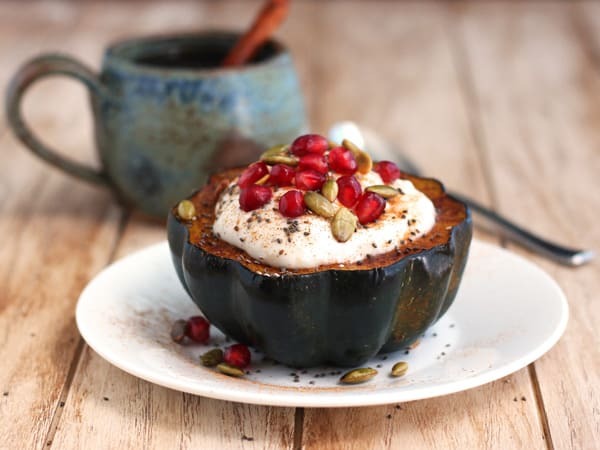 I love winter squash and love how you prepared this acorn squash bowl! Discovered your blog on Tasty Kitchen and I am super excited to follow you. This recipe looks and sounds delicious, fantastic job! Thanks Eric and Congratulations on the forthcoming new addition to the Happy Valley Chow family! i didn’t know it was possible to make squash in a toaster oven! Such a neat idea, this looks awesome!